If I ever got back all the money I ever spent on seeing Paul McCartney in concert, I’d probably only go and spend it on seeing Paul McCartney in concert. There are few things in life more enjoyable than watching Sir Paul perform. He has the energy of someone half his age, and the musicality that flows from the man is ethereal. Switching effortlessly between the famous Hofner bass, his sunburst and custom-painted Les Pauls and several acoustic guitars, including his Epiphone Texan right-handed model which was flipped to accommodate rock’s arguably most famous left-hander (complete with a Detroit Red Wings sticker), the ukulele and piano, it truly is a joy to see. His band of merry men are no slouches in the massive talent department either. You may not know, but Paul’s current ensemble have been playing together for almost twice as long as his first proper band did. There is veteran of nearly 30 years with McCartney, keyboardist and MD, Paul ‘Wix’ Wickens, Rusty Anderson – erstwhile member of the band Ednaswap, who performed the original version of Torn – on guitars, Brian Ray – former guitarist and musical director to the late and great Etta James – who is equally at ease swapping between guitars and bass, and last but certainly not least, gentle giant and powerhouse drummer, Abe Laboriel Jr. They all provide sweet harmonies and backing vocals. The mutual respect and sheer love of performing is patently obvious. You can almost taste the camaraderie shared between these five men. 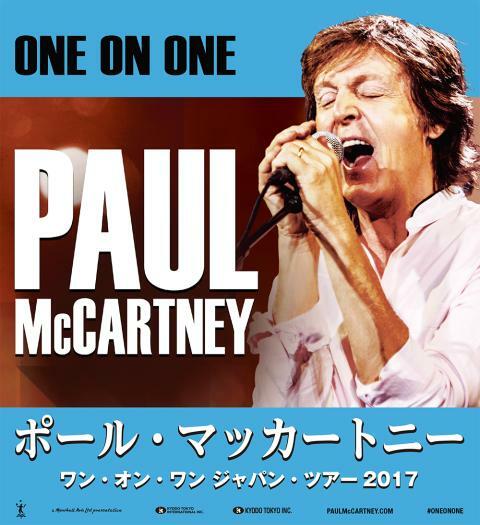 The first of three sold-out shows at the 50,000 seat Tokyo Dome’s audience erupted with deafening screams of delight with each song from probably the greatest ever back catalogue in popular music. A tad Beatle-heavy for this Macca apologist of 35-plus years, but with three dozen numbers from the past 50-odd years, there are no complaints. Paul happily tried to speak Japanese to his fans who lapped it up. When he spoke English, it was immediately translated onto the pair of huge video screens on both sides of the stage. The sound and lighting crew must also receive huge appreciation. The effects, including lasers, psychedelic imagery, backdrops, photographs and pyrotechnics are nothing short of spectacular. Playing for more than two and a half hours, with nary a sip of water, McCartney was in fine voice. Sure, there were a few hiccups, a dodgy bit here and there, but at just shy of 75 years old, and with no autotune or mimed vocals in sight, surely he’s allowed the odd off note. The crowd didn’t seem to care one iota. Lucky local fans David and his cute young son Leon, resplendent in an obligatory Apple logo tee, were plucked from the crowd to go onstage for a brief meet’n’greet. As the final notes faded and the lights dimmed, red and white confetti and streamers spewed out over the crowd. I was most impressed at how organized the staff were and how easy they made it to leave the enormous arena. Orderly and succinct. Most people were out of there within 15 minutes. Let’s hope the ever-growing rumors abounding of an Aussie tour later this year prove true. After a more than 24-year absence to our shores, this is an unmissable gig! Saw the final show of the set on Sunday and it was brilliant! Tokyo Dome provided every single person in attendance with a blue glow-stick to surprise Paul as he sang Hey Jude, and projected messages such as Japan Loves Paul on the Dome ceiling. A fantastic show well worth the entrance fee!